We know there have been some specific questions floating around about the HTC One Nexus User Experience since it was announced earlier this morning, and we've been working to get those questions answered. HTC has been kind enough to answer some of the questions we found most pertinent, so here they are. Will the stock Android camera experience replace the HTC camera app (and thus all the HTC features)? The HTC One Special Edition contains the stock Android camera experience. It doesn't contain HTC features such as Zoe, etc... It will not be the Sense camera experience, but the camera will still produce comparable high quality pictures. Yep, that means you will not be doing any Zoe-ing or video highlights, or really anything that the stock Android camera app doesn't feature. You do get Photo Spheres, though, so that's kind of awesome. The promise of comparable image quality should allay concerns in that area, though we'll have to see if the lack of HTC's dedicated night shot mode affects low-light pictures, or if camera performance is actually affected in practice. Will the IR blaster be functional? The IR blaster will be disabled out of the box since this is a stock Android device. Stock Android, surprisingly, does not support infrared devices, meaning the One's IR blaster won't work when the device ships. I asked for a little more clarification on this in terms of "if a later version of Android supports the feature, will it be enabled," but HTC declined to discuss the future. Edit: Relatedly, it seems unlikely that the FM radio antenna will be functional, either. The functionality is not a part of stock Android, and the FM radio app is an HTC-specific add-on. Will the Beats Audio mode software switch be present in the stock version (Hugo Barra has seemed to indicate it will)? It features the hardware benefits of Beats Audio, but it does not have the software indicator in the status bar. I take this to also mean the actual software switch for Beats has been removed. However, as far as the HTC representative we're speaking to is aware, the actual Beats software is still in there. So, the One NUE should sound the same as the regular One with the Beats switch on, but the One NUE will have no such switch. Beats will be on all the time. Not necessarily something I'd be looking forward to in terms of my headphone usage, though the EQ tweaks of Beats make those dual front-facing speakers sound hugely better. Will the HTC logo on the front be remapped (as it's an inactive button area) as the recent apps button, or will the old double-tap on home gesture still be used? 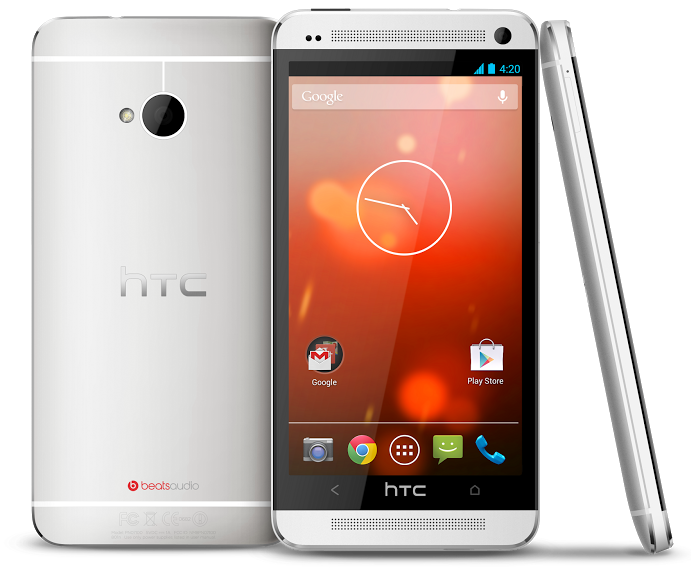 Button configuration will be the same as the original HTC One. This one was a stretch, but I figured it was worth asking. So yes, the capacitive button configuration will be exactly as it is on the regular One. There you have it - that's some of the nitty-gritty on the HTC One Nexus User Experience. It comes out June 26th (yes, in the US only for the time being - just like the stock Android Galaxy S4).